The menu is quite simple, although the custom theme ads a little visual interest. Notice also the AdMob graphic embedded at the bottom of the screen. In this case it’s showing a house ad, but normally a paid advertisement would be shown here. 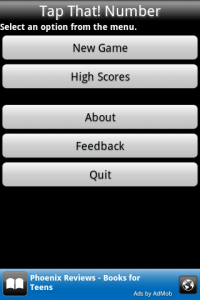 When you select New Game, a countdown timer begins, allowing 5 seconds to prepare for the game. As soon as the 5 seconds expire, the game board appears with 25 tiles and a timer begins counting up. This is accomplished through two separate threads, and the Android Message framework to enable asynchronous UI updates between the threads (If this doesn’t mean anything to you, keep an eye out for some upcoming tutorials on the subject). 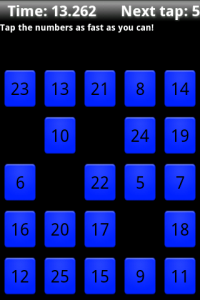 When the appropriate sequential number is tapped, that tile will disappear and an on-screen cue will indicate the next number to be tapped. 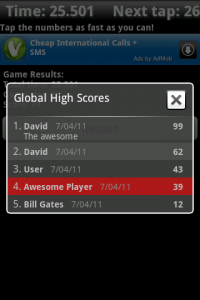 Once all the numbers have been tapped, the timer thread stops and the high score is calculated. 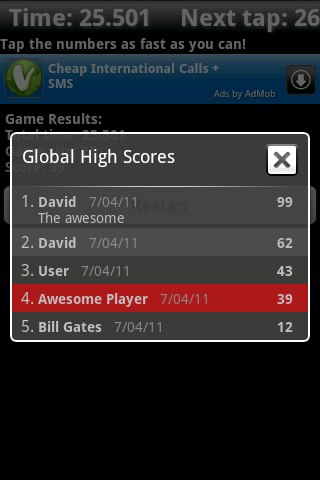 For this app, I used the ScoreNinja high score library. This was really easy to integrate (once I learned that passing “-1” as the current score would show the global dialog) and works quite well. In future I’ll probably use a larger library such as ScoreLoop and integrate some more social features, but ScoreNinja works well for this particular app. So there you have it – my first Android App. There are still plenty of features that could be added, but all the fundamentals are there. Feel free to download it and let me know what you think. Any feedback, positive or negative would be greatly appreciated. In the upcoming weeks I’ll be posting some tutorials and sample code based on what I learned from developing this app, so let me know if there’s anything you would like to learn about. Also, stay tuned for download stats from the Android Market as they come in.